This post is part of my partnership with Carrabba's Italian Grill. As always all my opinions are my own. My favorite way to eat out is family style - ordering a variety of small plates so everyone at the table can try a little bit of everything. I was excited to learn that Carrabba's recently launched a new menu called Carrabba's Small Plates - a meal to be shared with friends. The Carrabba's Small Plates menu has a variety of 6 dishes, all under $6 and under 600 calories. My husband Gabe and I recently went out to dinner with our friends Ashley and Ryan and were able to try out all of the small plates. If you plan on trying out the new Carrabba's Small Plates menu (which I strongly suggest) be sure to go on a Tuesday. Carrabba's Tasting Tuesdays is a weekly special where you can choose any 3 small plates for just $12. Plus you have an option to pair the Small Plates with a glass of Carrabba’s house red or white wine for just $5! That's what I call a delicious and inexpensive night out. As I mentioned, we tried every one of Carrabba's new small plates. Here is a review on each of the six dishes, all 600 calories or less. The crowd favorite was the Italian Lettuce Wraps. This is my fourth time ordering these so that has to say something. Unlike most lettuce wraps, the filling is cold - so the lettuce stays crisp. I love the flavor of the wood-grilled chicken, mixed with vegetable in a Mediterranean lemon vinaigrette. The ricotta salata cheese is a perfect topping. Our second favorite dish was Three Cheese & Sausage Stuffed Mushrooms - the mushrooms are stuffed with ricotta, romano, mozzarella, sausage and spinach, served over a delicious tomato cream sauce. These were gone in a blink of an eye. We all agreed that the Mozzarella Rustica was a delicious choice. 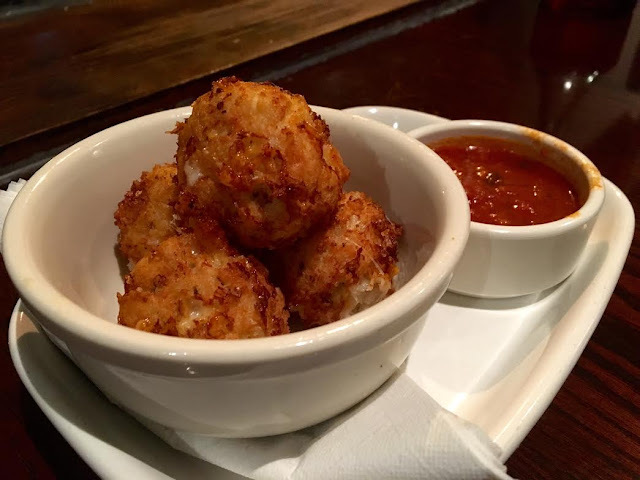 These are bite size fried Mozzarella and ricotta balls. They are served with Carrabba's popular marinara sauce and they did not last long on the table. Instead of a photo of the Meatballs, how about a video of how to make them at home (thank you Carrabbas YouTube!). These are great for those who a perfect meatball without over indulging. We also tried Grilled Apsaragus with Prosciutto - wood grilled asparagus wrapped in prosciutto and fontina, drizzled with balsamic glaze. This was a very good starter. We also tried the Bruschette Sicilini - Oven baked ciabatta bread served with diced tomatoes, fresh basil, oregano, red onions and kalamata olives. I didn't personally try it but those who did said it was very good. Carrabba's Small Plates are simply prepared and inexpensive - what more can you ask for?